Use tillers and disks to pulverize the soil to a depth of six inches of greater, preparing for the DuroEarth process. 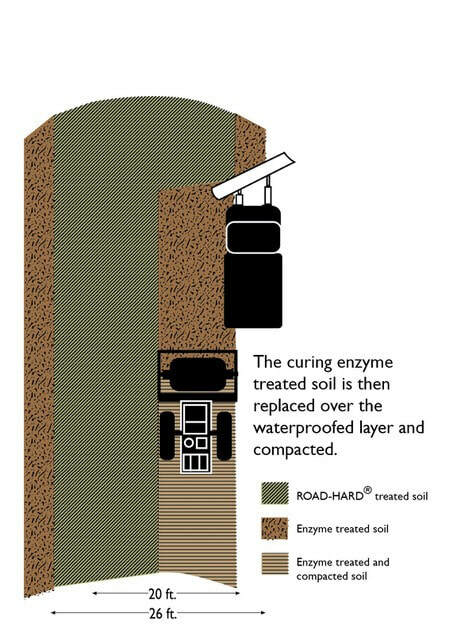 A water trailer or a truck outfitted with an adjustable spray bar will distribute the soil hardening enzyme solution. 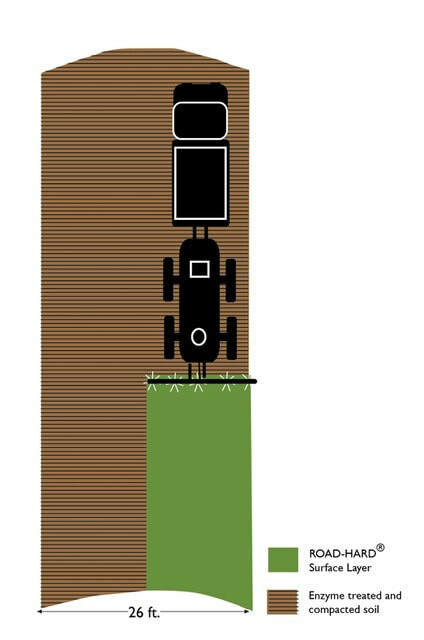 Once saturated, the enzyme is mixed thoroughly into the soil using a tiller of the TR3. 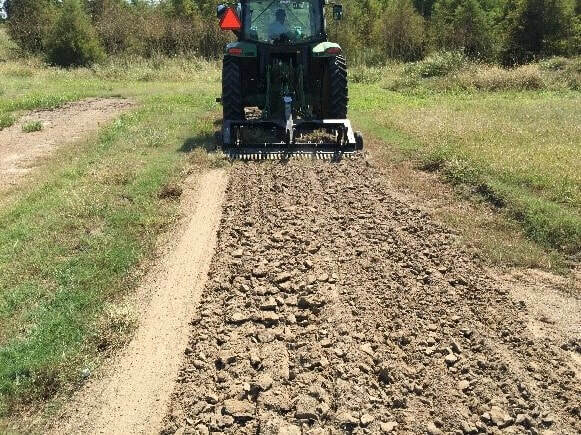 Turning the soil over with a moter grader blade also provides excellent mixing. 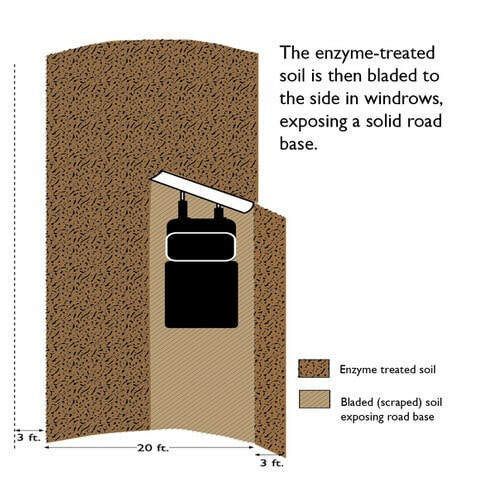 The enzyme-treated soil is then bladed to the side in windrows, exposing a solid road base. The treated soil is left to cure in the windrows for 24-48 hours. This process begins to dry and harden the soil. 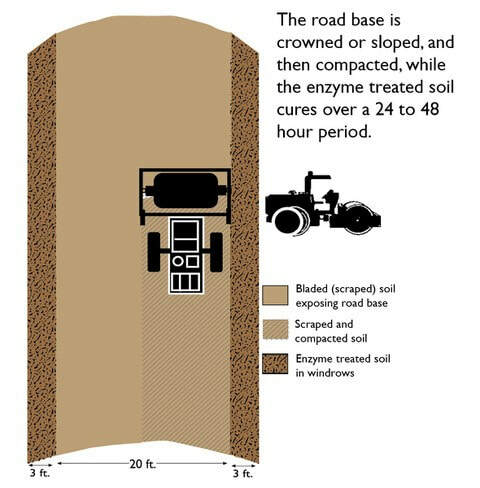 The road base is crowned or sloped, and then compacted while the enzyme soil cures over a 24-48 hour period. 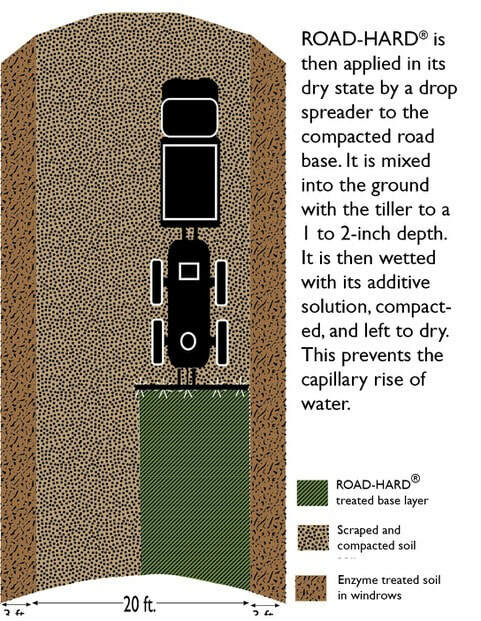 ROAD-HARD is applied in its dry state by a drop spreader to the compacted road base. 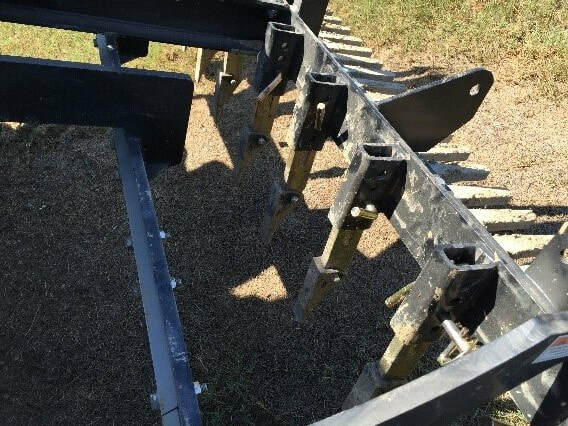 It is mixed into the ground with the tiller to a 2-inch depth. The ROAD-HARD Additive (not the enzyme) is then mixed and sprayed onto the ROAD-HARD covered base. This is then scarified, compacted, and left to dry. This prevents the capillary rise of water. After 24 hours the curing enzyme treated soil is replaced over the waterproofed layer and compacted. The roadway and shoulders are treated with ROAD-HARD again (repeat step 6). This waterproofing solution encases the enzyme hardened soil in a water-resistant envelope. ROAD-HARD and TerraZyme can be purchased on our store.